Quite a bit has happened since being Meet the Artist in 2017; but most importantly, has been the development of my practice. It’s been useful to reflect on what I wrote then, to reflect on the view I had on my practice as it stood at the time. Meet the Artist also serves as a marker in time, a flag that fixes points within an artist’s life that delineate key junctures. Sometimes the thread that connects these together may circumnavigate whole time periods, revisiting old works to re-invent, collecting them together to re assess, or wrapping around fixed points again and again, existing in a period of stuck-ness, a time loop. Can you tell that I have become fixated by Star Trek Discovery? The crew are learning how to navigate the mycelial network (which leads to the discovery of a parallel universe) and are now facing the Red Angel, who visits them from the future. My evenings spent watching this often feel a little self- indulgent, but I’m insisting on seeing it as research, having already used it as an example when discussing concepts of time with my students from the CE Academy (on the Fermynwoods Contemporary Art Education Programme), and now here, relating it to my art practice; so no guilt required. I wonder if I could do a ‘Re-Re Meet the Artist’ in a few years hence, to loop the loop? The loop serving as a useful indicator as to how an artists practice can proceed/change/deviate or rest. The selected images are interesting too; only one of those which I chose to be featured in 2017 have been developed further (but not yet ready to be showcased) one has been resigned to the ‘great idea, but not for now or in the near /mid future/ if at all’ pile and the other serves as a bench mark for other works that have followed. Here now follows a schedule of activities that have occurred since March 2017. 2017: Awarded Arts Council Funding to deliver a community Big Draw Event in my village. The theme in 2017 was ‘Living Lines’. 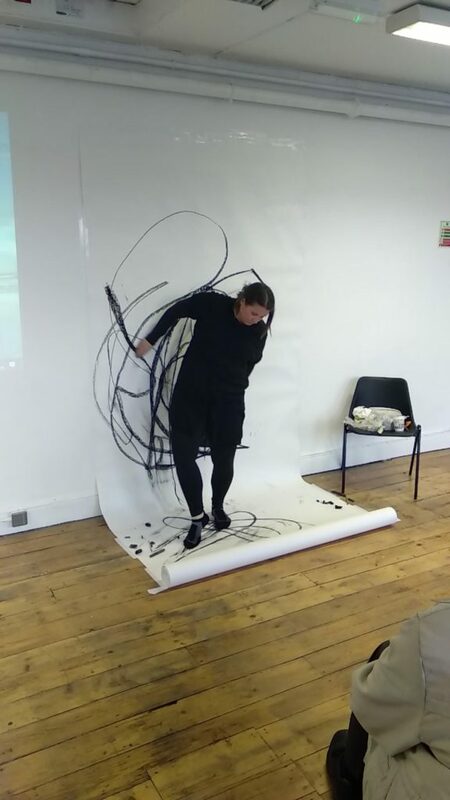 I devised and led a day of workshops in experimental drawing, inspired by the local landscape. It was a great success and we have continued with community drawing events ever since. Participants were invited to ‘have a conversation’ or to just talk to me if they were in need to get things off their chest. This pilot focused on four conversation topics: Money, Diversity, The Environment and Education. 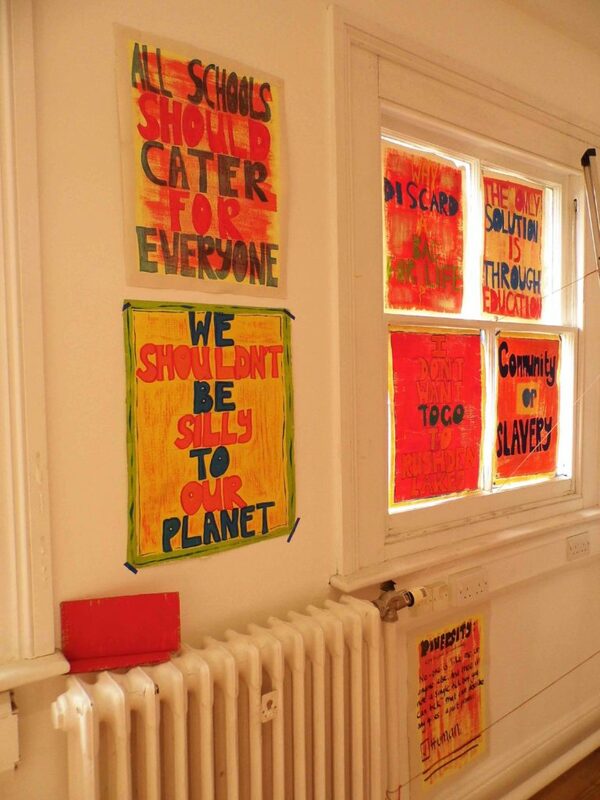 The conversations were transcribed onto large sheets of wallpaper and the participants invited to select a key phrase to use in creating their own campaign poster. The final element being a symbolic hanging of ‘aired laundry’. Through each participation, the conversation builds, ideas exchanged, opinions challenged and an installation created over time. Colour is a key factor in all visual protests, for both symbolic and marketing reasons, in particular red: the most attention grabbing and visually arresting of colours. 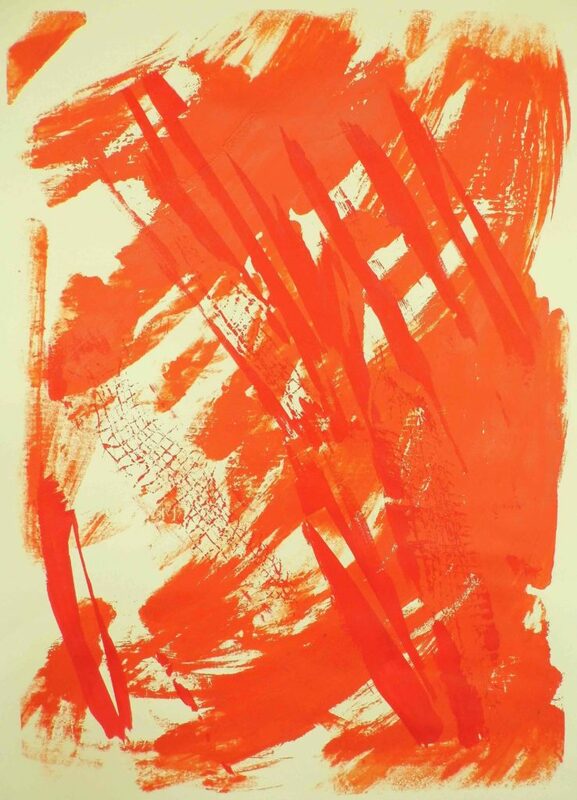 2017 – 2018 AA2A Residency at De Montfort University The theme of red continued here as did the work for ‘You Can’t Shake Hands with a Clenched Fist’. To progress the project, certain issues that had arisen from the pilot needed to be resolved. To enhance a visual cohesivity, I designed my own typography and proceeded to experiment through traditional screen -printing techniques a process of poster making that could be suited to working with the public, when rolling out this project on a larger scale. This led to a selection of designs (using an intricate set of stages) for the official poster to be used for the project moving forward. Those long periods spent waiting for a layer of ink to dry, were put to very good use. To counter balance the anxiety inducing preciseness of typography and registration marks, I WENT FOR IT and released these pent-up emotions via a rampage of mark making, channelling the full force of my body into and through the tightly woven and intricate mesh of the silk screen. 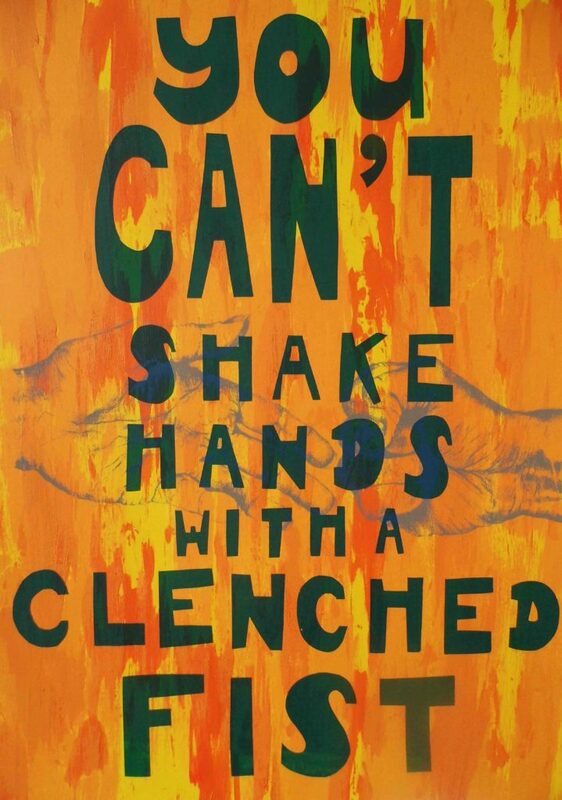 You can read more about ‘You Can’t Shake Hands with a Clenched Fist’ project and my AA2A residency here. In 2018, I joined a Women’s Artist Peer Support Group (Ignite). 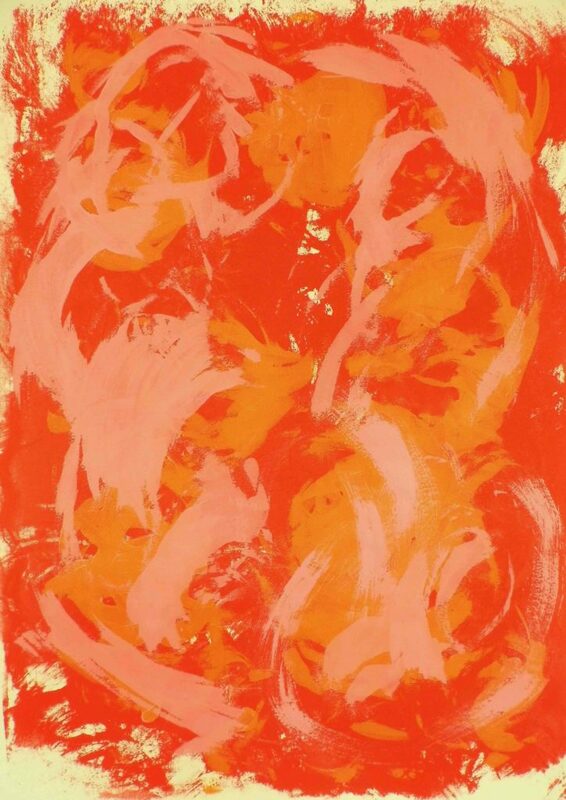 The group was set up with the idea that we all shared printmaking as a commonality in our practice, but it emerged that it is perhaps our themes, inspirators or methodologies that have the most commonality. Initially doubtful as to whether a Peer Support group was for me, I’m now a fully- fledged convert. We’ve supported each other through moments of creative stumbling blocks, the ‘what am I?’ questions, bouts of self- doubt, networking and professional dilemmas. We’re now in the preliminary stages of planning our first projects. We’re taking our time however, feeling no pressure to launch in haste. 2018 also saw the extending of my role at Fermynwoods Contemporary Art to becoming its Education Curator. I now manage the Alternative Education Programme, as well as curating, organising and chairing the Free Exchange Events. You can watch Art and Wellbeing, Art and Energy and Art and Future Resilience here. The next Free Exchange Event is on 20th May at East Carlton Park, entitled ‘Art and Landscape’, with artist Onya McCausland. You can follow Fermynwoods Contemporary Art on Twitter, Facebook and Instagram for updates, or sign up to our mailing list here. 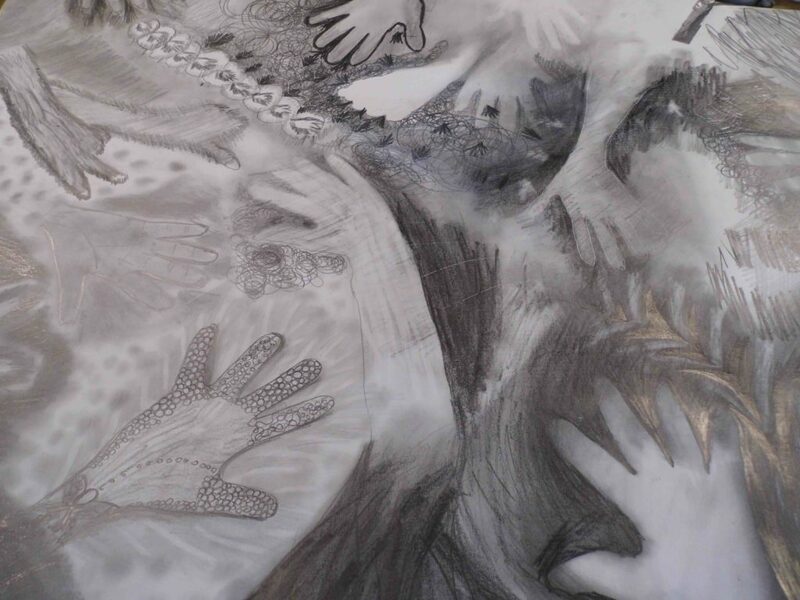 This year, it is the Ten Years anniversary of with working with CE Academy on our Alternative Education Programme and we are celebrating this with a series of reflective writings by myself, James Steventon (the director of Fermynwoods Contemporary Art) Education Co-ordinators Sophie Cullinan and Jessica Harby, along with artists that have been involved in the programme. We’ve called this Alternative Monday’s and we’ll publish a new piece of writing every two weeks. And lastly for 2018, I was nominated (by a wonderful person/s unknown) to become a Fellow of the RSA with reference to my work at Fermynwooods Contemporary Art with young people who have been excluded from mainstream school. Changes that were happening in my life at the time delayed my acceptance, as did a deliberation over whether this was the right fit for me. Despite its traditional sounding title, it’s a forward-thinking organisation which sets ‘to enrich society through ideas and action’. Fellows are spread across the globe and their interests and backgrounds are wide ranging. Through a long- term involvement with the RSA, I hope to contribute to research, campaigns and the development of projects, on issues that I am passionate about, including Climate Breakdown, Inclusive Education and the holistic and life changing benefits that Involvement in the Arts can bring. In January, I was invited by Luke Harby to be the lead artist at the ‘Work in Progress’ meeting at NN Contemporary Art. Seizing the moment, whilst reflecting on the meaning of Work in Progress within my own practice, I decided to do a performance drawing. This was unrehearsed (apart from an imagined run through while sitting on my hour long X4 bus journey) and impeded by a dangling arm rendered just so by an unresolved injury. Never the less, I was pleased with my resultant drawing. I’m finding with the performance drawing side of things, that it’s either the performance or the drawing that wins out, I have yet to manage both. Hence the performance, although a ‘one off’, I considered to be an ongoing ‘work in progress’ as part of continuous investigation into this art form. 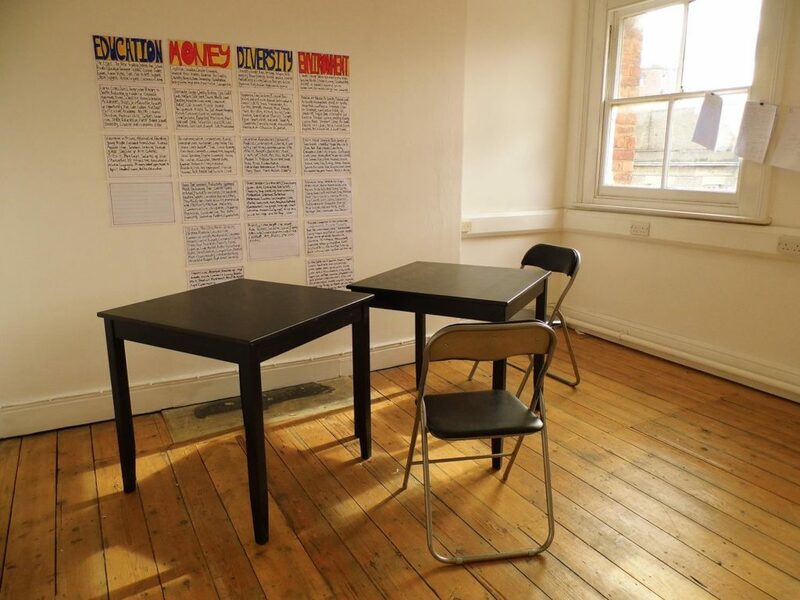 Four days before the WIP meeting, on January 15th, I joined Jessica Harby for our first workshop for the Artists in Residence at C2C Social Action (to follow on Facebook –https://www.facebook.com/ArtistsC2C/ and on Twitter @C2CArtists. As I write, this Tuesday will be our last workshop on what has been an amazing project. The project was set up by Sally Sheinman in conjunction with C2C, which is in organisation that supports vulnerable women. It is supported by the Arts Council and the RSA. Along with Jessica, Sophie Cero and Annabelle Shelton, we’ve been working alongside the women every Tuesday and Thursday for the last three months exploring a number of art forms. Working with these amazing women has been an absolute honour. Many of their life stories are heart wrenching and their journey’s incredible. We established real bonds, connecting as women in an unstable world. We have shared both laughs and deep artistic connections. 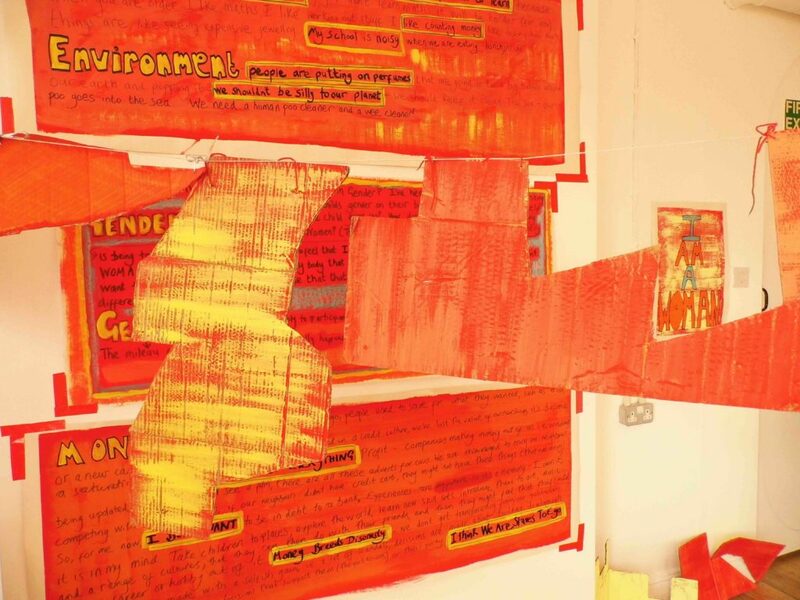 As artists, we’ll be creating a piece of work in response to this residency, which will be shown in an exhibition alongside art works created by the women involved in the project. We consider the women artists in their own right; and this project has been very much about a collaboration of ideas, inspiring each other as a group throughout the process. From Wednesday 8th May to Saturday 11th May, 11am to 6pm, in the Project Space at NN Contemporary Art in Northampton, I’ll be showing the art work that I have created in response to the C2C Artists in Residence project; alongside the work of my fellow artists, the women at C2C Social Action and Jessica, Sophie and Annabelle. 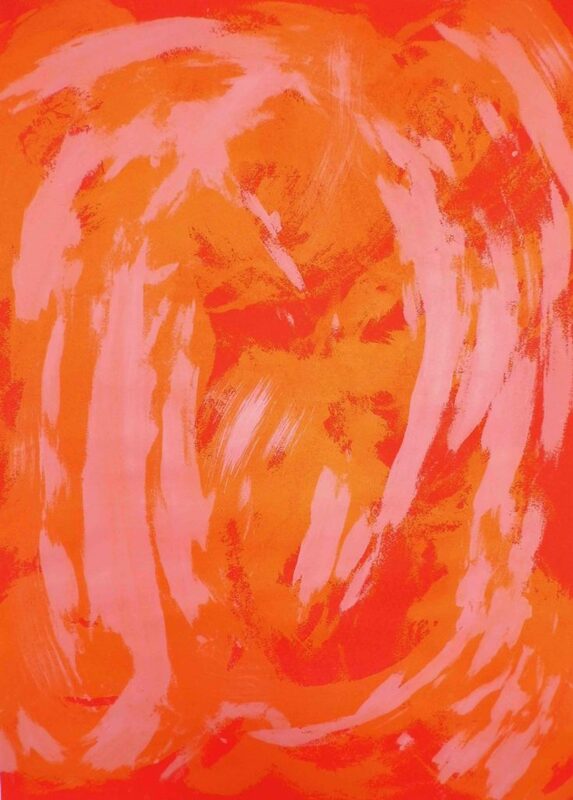 The Private View is on Wednesday 8th, 6pm – 8pm. 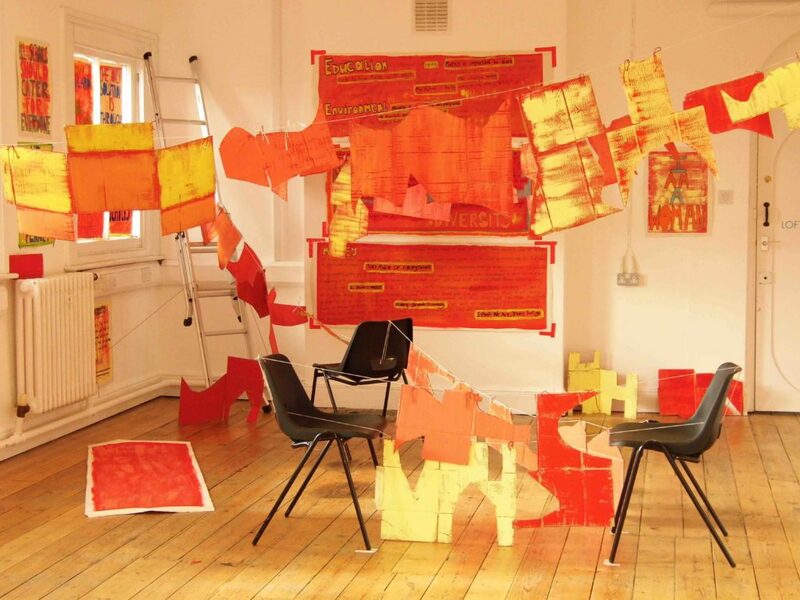 On June 11th at the University of Northampton, the RSA will be hosting a panel discussion and presentation of our work on the C2C Artists in Residence project. This event will be live streamed. Look on our Twitter, Facebook and Instagram pages for more info. On June 25th, I will be joining Graham Fudger from Illuminating Arts, along with fellow panellists, for a Tuesday Late discussion at The Platform Café in Northampton. We’ll be discussing the merits/ de merits of the public v commercial galleries and everything in between. 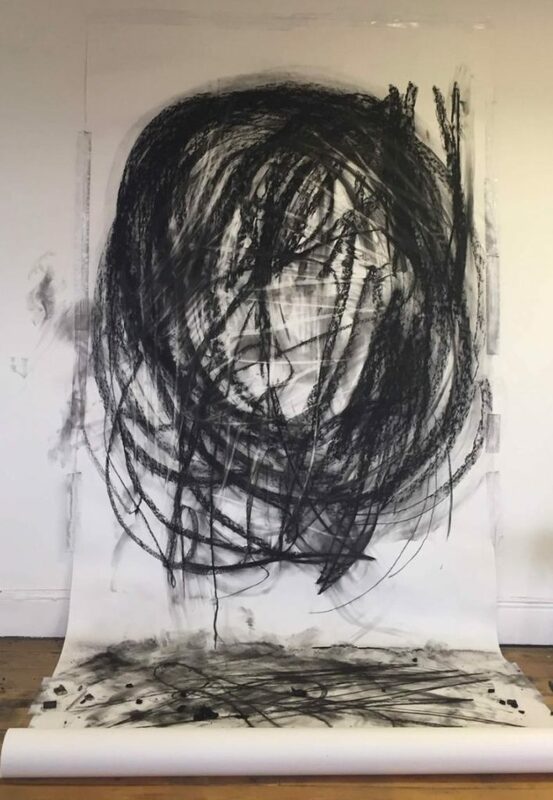 And as always, there are updates of work and news on my website, including further prints from my AA2A residency at De Montfort University, and more images of the WIP performance drawing. 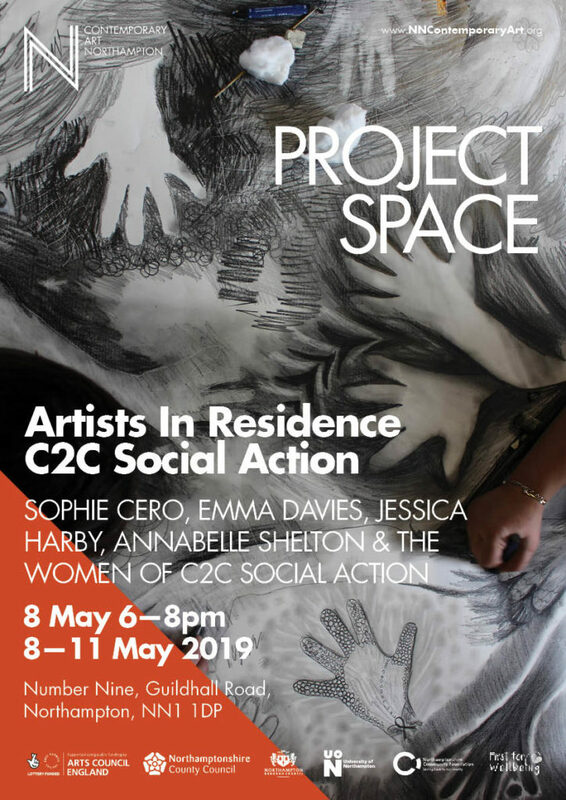 ‘Poster for Artists in Residence at C2C Social Action’, featuring work created by the women who took part in the project, in a workshop led by Emma Davies. Emma was interviewed in April 2019. All images were taken by and are courtesy of the artist.